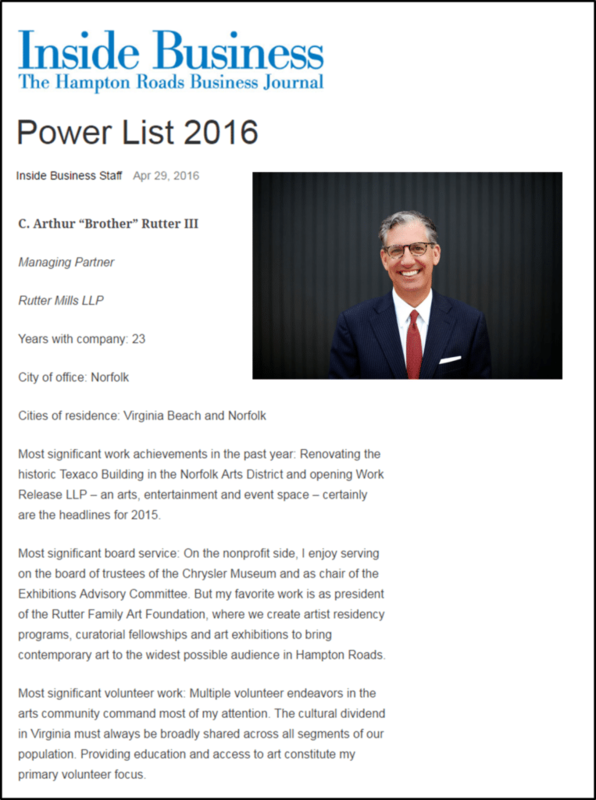 C. Arthur “Brother” Rutter, III, our managing partner, has been named to Inside Business Magazine’s “Power List 2016!” Inside Business, a publication of The Virginian-Pilot, defines this list as a “roundup of the leaders of our community who find themselves in the vanguard of consistently getting things done.” For Brother Rutter, “getting things done” means more than growing the law firm of Rutter Mills. It means helping to enrich our community, especially by supporting and providing access to creativity, culture and the arts in Hampton Roads. The story is featured below. We invite you to check it out!